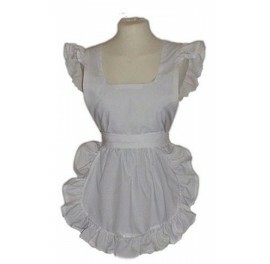 Pretty Sissy maids apron in white, ideal for starching and keeping ready to wear over your favorite dress when Madam calls! Poly/cotton easy to starch and keep crisp Long waist ties Large over shoulder frills Back straps button at the waist and can be adjusted Finished with a stiff whi..
Our lovely Amy Sissy apron with long ties and cotton lace trim Colour: White poly/cotton ..
Sissy Apron in poly/cotton with short circular frilly skirt with 3 inch lace trimmed frill all around and shoulder straps that go from front to back trimmed with cotton lace and long ties. Comes with half moon hat with lace and ribbon ties. 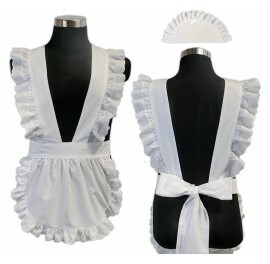 ..
White bib front apron with long back ties and cross-over shoulder straps with frills over shoulders and down back straps. 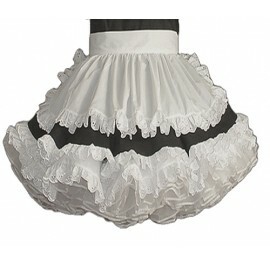 Has semi-circle skirt with frills all around. Also included a white half moon hat with lace trim and ribbon ties. A lovely addition to your Sissy wardrobe! Available in ..
Apron in gorgeous satin choosing any of the available colours for the contrast lace and ribbon trim will compliment any Sissy dress! 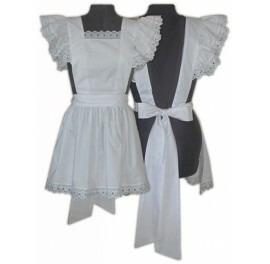 Apron is made in white satin with long ties Double thickness pocket with lace and ribbon bow in the colour of your choice A layer of white lace with co..
A PVC Victorian Maid Apron in PVC with shoulder frills, long ties and buttons to fasten at the waistband. Custom made ..